About 838,000 people were living in Amsterdam in 2016. The city hosts two universities (the University of Amsterdam and the Free University Amsterdam) and an international airport "Schiphol Airport". About 2.2 million people live in the metropolitan area. 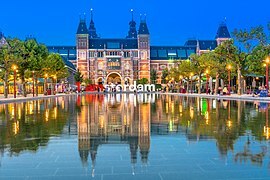 The city of Amsterdam is the world's most multi-cultural city. It has people living there from 175 different countries. Like other big cities in the Netherlands and elsewhere in the world, Amsterdam is unfortunately subjected to many criminal activities. A dam was built in 13th century in the river Amstel (that's why the city is called Amsterdam). The old harbor of the city, Damrak, is now one of the busiest streets in the city. The city was for the first time mentioned in 1275 by count Floris V, count of Holland and Zeeland who gave the people of Amsterdam some more freedom. The city got its city rights probably in 1306; at least soon after the year 1300. The city became a major trading port pretty soon, with a successful trading route to the Baltic Sea. The city grew fast in the 15th century. Because the city basically lies in swamp, the builders of the city had to dig canals to use the digging-ground for getting the living-ground higher. Homes were built on wooden poles, and the canals served as a pretty effective primitive sewer. The city was one of the first cities in Western Europe to be fairly democratic: Wealthy citizens chose the leaders of the city. Amsterdam declared war on the Spanish in 1578, during the Eighty Years' War. When the city of Antwerp fell to the Spanish in 1585, many people of Antwerp fled to Amsterdam. Antwerp was also a major trading city, and when its people moved to Amsterdam, they took their trading-networks with them. That's why Amsterdam became an even more important trading city after that. This launched the Dutch Golden Age. The number of people living in Amsterdam during the War rose from less than 30,000 in 1570 to over 100,000 in 1622. That number would even rise to 200,000 near the end of the 17th century, making the city a very large city for its time (only London and Paris also had that many people). In the 18th century, the number of people living in Amsterdam fell back to 140,000, ending the Golden Age. The 19th century was the time for the first trains and trams in Amsterdam. The first train ran from Amsterdam to Haarlem in 1839. The number of people was rising, with about 250,000 living in Amsterdam in 1850, and more than 500,000 in 1900. Amsterdam was a heavy industrialised city by then. Before the Second World War, there were about 140,000 Jews living in Amsterdam. Most of those people did not survive the war. After the war, Amsterdam became a centre of tolerance and culture; to be different is not abnormal in Amsterdam. It is expected that Amsterdam will grow 12.6% until 2025. It will then hold almost 900,000 people, and the metropolitan area will hold almost 2.5 million people by then. ↑ 3.0 3.1 Anita Bouman–Eijs; Thijmen van Bree; Wouter Jonkhoff; Olaf Koops; Walter Manshanden; Elmer Rietveld (17 December 2012). De Top 20 van Europese grootstedelijke regio's 1995–2011; Randstad Holland in internationaal perspectief [Top 20 of European metropolitan regions 1995–2011; Randstad Holland compared internationally] (PDF) (Technical report) (in Dutch). Delft: TNO. Retrieved 25 July 2013. ↑ "CBS Amsterdam Bevolkingsontwikkeling; regio per maand". ↑ "Economische Verkenningen Metropool Regio Amsterdam" (PDF). This page was last changed on 28 January 2019, at 14:41.